Actually, it's not a new idea, it's an old problem. I'm just hoping to make use of it. An. of course, since I just thought of this, it's likely dozens of others have thought of this, too. Class B amplifiers use two transistors in a push-pull configuration. The problem is, that unless careful, proper bias is applied, there is what'd referred to as "crossover distortion" where neither transistor is turned on - due to semiconductor turn-on voltage drop. It seems like this distortion would add interesting harmonic content to the original signal. Is there any way the effect could be expanded to be used in a distortion pedal? I'm not getting older, I'm getting "vintage"
The ZVex Machine pedal deliberately uses crossover distortion. It's an acquired taste. I've experimented with it and find that it shows a preference for use with bridge humbuckers. As this video demonstrates, depending on the particulars of the circuit, the clean signal can still be heard. As well, deliberate use of crossover distortion on its own does not produce any of the reduced dynamics we are accustomed to from traditional clipping of high and low waveform peaks. This is why ZVex includes a "Limit" control. Several distortion pedals incorporate crossover distortion as a component of their sound; the high-profile Boss HM-2 being a textbook example. Unlike the Machine which ONLY uses crossover distortion, via silicon transistors and their forward voltage, the HM-2 uses a pair of germaniums, with a lower forward voltage, resulting in only a bit of X-over distortion, compared to the Machine. I added some X-over to a modded clone of the Gretsch Contrafuzz, with controls that allow one to blend in varying amounts of clipping and X-over. I start futzing around with it around the 1:20 mark here. I used a pair of germanium or Schottky diodes, in order to trim off only a bit of the waveform as it crosses over. The X-over control (upper right hand knob) essentially provides a lower resistance path to a back-to-back pair of diodes in series with the signal. So, several things to take into consideration, then. Crossover distortion doesn't sound thrilling on its own. At least not without a bit of filtering and limiting. It can add to the quality of an otherwise distorted sound. If you plan on playing with it, I would suggest using Schottky diodes, and perhaps a 3-way toggle to select between one pair and two pair of back-to-back Schottkys, and no series diodes at all. Whatever you feed that path with should probably have variable gain, and maybe some low-pass filtering as well, rather than simply adding filtering on at the end/output. Best of luck, and have fun with it! Thanks for the references. I suspected it was not a new idea. It's something to play with, though. Class B amplifiers use two transistors in a push-pull configuration. The problem is, that unless careful, proper bias is applied, there is what'd referred to as "crossover distortion" where neither transistor is turned on - due to semiconductor turn-on voltage drop. There's an oldish Peavey patent regarding this. They applied the idea to the power amplifier section; but there's no reason it couldn' t be used in the preamp. I believe they continued to use the idea in their Transtube series of amps. There's a (IIRC similar) US patent without the diodes. There is a bit of crossover distortion in the HM-2 but the signal is quite large at the point where the diodes are located because the signal is highly amplified by that point, so they function more as a crude noise gate rather than for their distortion characteristics. They do add some fizz though, and one mod is to add a capacitor to ground after the diodes to roll off some of the high fizz. The DOD FX-56 is a similar design with series Ge diodes, and I have seen it on amps by Peavey and Marshall, where the signals are quite large and the distortion from the diodes is small in comparison. That's why I thought it a useful idea to use diodes with small Vf, and have the option of cascading multiples, such that they could be used to introduce varying amounts of X-over distortion, OR, as you wisely note, function like a crude gate. I used a B2B pair on my Anderton/EPFM Ring Modulator to block the carrier-whine that I couldn't completely null out during the quiet bits. Is there a simple way to use diodes with a higher Vf, and provide a variable DC bias to introduce different amounts of X-over? Cascading pairs of Schottky diodes seems reasonable enough, but sometimes the "best" setting might lie between this and that many pairs of diodes, so a continuous bias control seems more usable. Alternatively, maybe that's what variable gain in the preceding stage is for. There are several ways to skin the cat. Peavey “T-Dynamics” distortion uses diode clipping and plays with offset voltage levels and bipolar supplies. Quilter and Line 6 use “diode steering” with forward biased diodes, which become reverse biased at high enough amplitudes and clip the signal. New Quilter circuit (the patented one) is basically similar to what you find from the vintage Pignose 30/60 amp (produced by Quilter, the "vintage " Quilter that is), except that the new circuit adds dynamically varying DC reference for clipping diodes in order to emulate sag. Some Line 6 power amps also incorporated similar ideas. Can't remember which ones from top of my head. 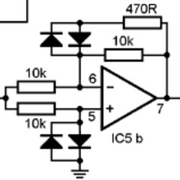 The simplest circuit to achieve the effect I’ve seen so far is featured in, for example, Roland GC-408 amp (Google for the schematic). It basically employs two complementary emitter follower amps in a push-pull configuration. They operate in class-A at small signal levels, but when overdriven the base bias voltages start to shift and crossover distortion starts to creep in. The circuit not only introduces crossover distortion but also peak clipping, which is moderately “soft”. Peavey uses similar circuit in the “Dirty Dog” pedal (Google for schematic). Otherwise the idea is the same: Large signal inputs will gradually shift the bias and crossover distortion is introduced. The pedal doesn’t otherwise incorporate the “T-Dynamics” power tube emulation so they added a simpler circuit to create the effect. Two transistors, three caps and three resistors. Very simple solution. Whatever you do, basically you want parallel signal paths, like in a push-pull circuit, and then some dynamic DC bias shift during (asymmetric) overdrive on these signal paths. The signals can be either true push-pull, “balanced”, or alternatively you can exploit bipolarity of solid-state devices, in which case signal inversion is not required. You naturally want crossover distortion to appear only during -sustained- overdrive. On “clean” signal it would sound terrible. The Boss HM-2 Germanium diodes – which is actually a NOISE GATE circuit - do introduce crossover distortion, but they do it already at small signal levels and therefore the effect can be audible and disturbing. Small signals get that “gating” effect. Such “noise gate” effect is different from crossover distortion that arises only during sustained overdrive and is more or less masked by other distortion. Boss design gets some remorse due to its very high gain that ensures that small signal levels below the gate’s threshold are effectively considered as noise and can be cut out. But if you add that circuit to clean signal path the effect sounds horrid. Edit: Yes, Peavey has long history in spicing up the (power amp) clipping distortion with dynamic crossover distortion. I reckon it adds a bit of touch sensitivity because harmonics created by the distortion are basically interacting with overall signal envelope instead of being "fixed pattern". The linked patent is actually the driver for Peavey's hybrid VTX series power stage. Basically, a practice in how to turn a Music Man power amp more "tubey". The later TransTube amps employed a different distortion circuit for the "T-Dynamics" power amp (There is a patent for it) and several Peavey tube amps have grid clipping diodes on output tubes that emulate grid conduction while actually preventing real grid conduction (and all ill effects associated to it, like skyrocketing of screen current). Peavey obviously has considered the dynamic crossover effect quite important for overall tube amp tone. ....for a few decades already! Yeah! I love cross over distortion! The 10k on the right is replaced with a 100k pot in series with a 33k, so it has higher gain after the fold. The diodes to ground are red LED's (Vf=1.3v), the feedback diodes are white super bright LED's. The feedback led clips only the middle part if the wave form, not the peaks generated by the folding process. This results it the peaks being higher than the flat top. The widths of the peak vs the middle parts is dependent on the size of the input signal, and changes the tone while a note dies out. The gain before the folding stage goes from 10 to 50, so about as much as a tube screamer from 1/4 of the way to half way . But due to the higher gain in the folding stage and the nature of folding in general, the amount of distortion is massive. Thanks to every one that replied! Lots of stuff to think about! One of these days I'll have an idea that no one has thought of yet (and there will probably be a reason for that! ).